⬅ 2015 – Happy 4th Of July! I’ve had a problem for a long time. One that I was scared to admit. In fact, just telling others about it terrified me to my core. My problem? Dealing with way too much email because I have a bad habit of opting into so many different newsletters. It’s practically criminal. On any given day, I slog through hundreds of emails. I don’t read most of them. My daily ritual involves scrolling through my gmail app using my thumb to highlight all the emails I plan on deleting. As I looked at how much time I spent “working” on my emails, I knew I was wasting a lot of time. Just scrolling through email could sometimes take me up to an hour and a half per day. I knew I had to do something. It was time to unsubscribe from all the emails newsletters. But the idea of scrolling through thousands of emails and manually unsubscribing from each one seemed like a task reserved for punishment, something they would make you do in school if you got in trouble. So even though I knew I had a problem (hey, that’s the first step! ), I kept putting it off. As I scrolled through Facebook, I noticed a little ad for a company called Unroll Me. They claimed it was an easy way to clean up your inbox. I was intrigued. I had often thought how cool it would be if there were a way to to unsubscribe from all my unwanted newsletters at once but just didn’t think it was possible. And here was this company saying no only is it possible – we’ve already done it. Of course, the scam word pops in my mind. Can I trust this software with access to my email? Well, good news, as I went through the process, I found out they don’t need my password. With Gmail, they use a process called OAuth which means I’m not handing over my password. A full review of their service later, I was convinced. This company is legit and is doing amazing things. I couldn’t believe it. Sure, I’ve had this email address for about 6 or 7 years now, but still, that number shocked me. I had my wife run her email account, and she had about 200. A business partner of mine had just shy of 300. So, yeah, I had a problem. After clicking a few buttons and deciding on what I wanted to keep and get rid of (took about 30 minutes), I was done. Just like that I had unsubscribed from 927 newsletters. And I didn’t even get to mention the best part – it was all FREE. Then, I found something else incredible that Unroll Me does for you. Seems weird, I know. But there is a line between I love getting this email, and I never want to hear from these people again. Thankfully, Unroll Me understands that. 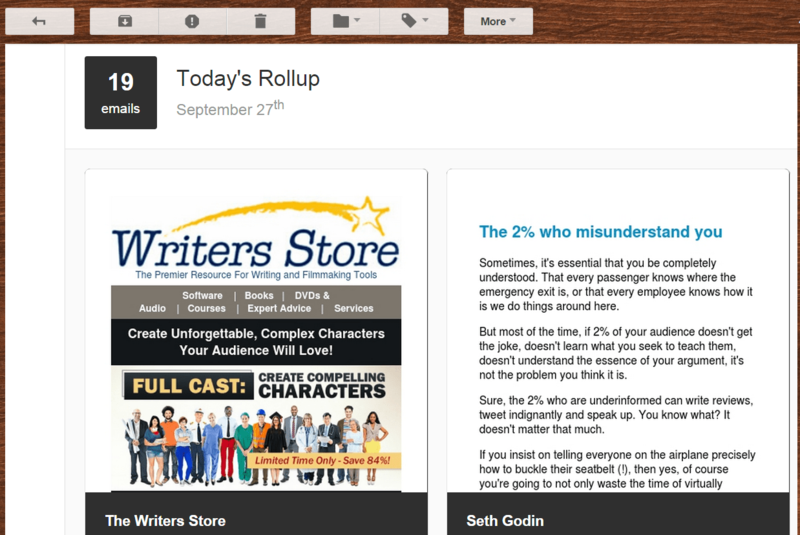 They created a feature called Rollup that lets you combine whatever newsletters you want into one simple and easy to digest email. If you want to read the full email, you can click on it. Here’s a picture of one my Rollups. I didn’t take a screenshot of all of them, but in this one email there are 19 different newsletters. If I click on any of them, I can read the entire email and click on links, etc. It truly makes it so much easier to consume the content I want. If I had one complaint about the Unroll Me service, it would be this. They didn’t prepare me for the emptiness I would feel opening up my gmail and only seeing 1 or 2 emails. I know this sounds funny, but it’s strange for me now. I check my email habitually and am used to a certain amount of volume. Now, I can go hours with only receiving 4 or 5 emails total. I guess that’s what happens when you unsubscribe from almost 1000 newsletters. From a software and user experience, Unroll Me is incredible. It was quick, easy, and to the point. I did the whole process on my Samsung Galaxy S6 Edge+. One thing that would have been nice was a “select all” button that would allow me to uncheck the subscriptions I wanted to keep instead of checking the ones I didn’t. In my case, I kept only about 100 and removed close to 1000. This option doesn’t appear to be on the desktop version either. In my final review, I give Unroll Me 4.5/5. I think they are a great company serving a great purpose. As we march on into the internet age, I can see cleanup and organization becoming a bigger and bigger component of people’s digital lives. Sort of like spring cleaning is for your home. To learn more about Unroll Me and see how many subscriptions you currently have, you can start the process by going to the Unroll Me site. Side Note: Do any of you have the problem I have where you are trying to select an email in gmail, but instead you open it? Worst. Thing. Ever. I hope they fix that someday. Or maybe it’s just my giant thumbs causing problems? Let me know. 445 for me. Yeah! Just unsubscribed from a bunch. Thanks. I am trying to use Unroll. You said they don’t ask for a password but they do!! I think you just login to your gmail… at least that’s what I had to do. Thanks Kurt that makes sense. I am about to go try it out, am afraid i will have the same problem with you. my email address is 14 years old and i have been using boxbe to filter. I am still very happy with it. Hopefully you are too. Sometimes it’s a tradeoff. I don’t know if that’s 100% for sure either. What is your source on that? This is very interesting. In this day and age, it’s all about data collection. From what they say though, it seems like unroll.me isn’t tying the data to you as an individual. And that is ok by me.